With the autumn season coming at us in full blast, in this post I want to share with you some of the items that I want to get my hands on. Some are trending, others are jaw dropping and all of them are screaming my name (yes, many times they speak loud and clear). Also, with Fashion Week going on right now, I couldn't just sit, I had to see what's going on.... so I headed to StyleWe for the hottest designer wear at more reasonable prices. It's all a girl could ever dream of! Unlike the designs at fashion week, the clothing at StyleWe can easily become part of our wardrobe and something that we can wear from day to day. I'm sure this fact makes you as excited as me because you know that if fashion was all about looking instead of wearing, it would have been so boring for all us fashionistas who want to have it all.... from clothing to accessories and then back around. These StyleWe items that I'm going to reveal to you (in a second) are my dream picks for this fall/winter season. You wonder why? Well, you'll see and read it all pretty soon. Summer may be coming to an end (not for at least 2-3 weeks for Las Vegas), but summer dresses will never go out of style. They're the ideal apparel not only for the hotter seasons, but also for the fall because you can wear them with leggings underneath and a coat on top for extra warmth and style. 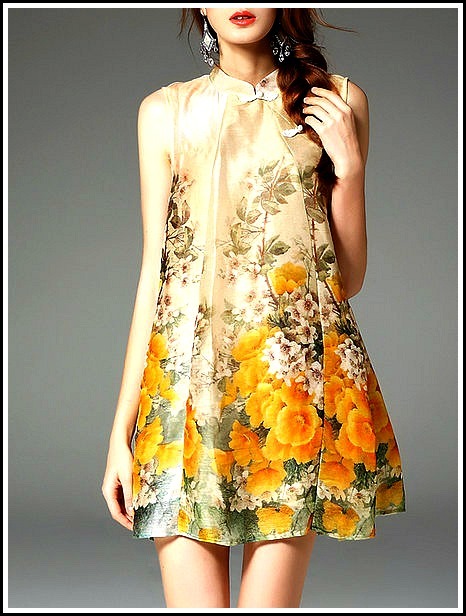 Especially floral dresses like this one that are vintage looking and can add some color to your usual grays, blacks and neutral tones. I like and really want this StyleWe dress because it's so pretty and I know that it'll keep me feeling like it's summer all year round. A black trench coat like this one is on my wishlist (has been for a long time) this coming fall season because it'll go great with everything else, and you know, being stylish in the colder days is even more fun with all the layering. I love that you can literally create a million looks with just one piece being the focus. I'm so passionately obsessed (don't know if a feeling like this one exists), but really I am. If any of you want to surprise me with this coat, I'll love you forever even though I already love you lots. More love won't hurt anyone!? I'm immensely in love with StyleWe's blouse selection, and cute ruffles like these ones always get to me, so this shirt is one that I want to call "MINE". I love that it's classy, perfect for work or play (you don't have to change, it works for any occasion). That alone makes it total #dreamgoals in my eyes! Plus, black and white together is a whole lot sweeter to look at and wear. Have a look at their many pieces on their website. Just be warned, you'll end up filling your shopping cart to its max. I'm sure that by now you have noticed that anything in denim patches is so popular whether it's jeans, jackets, vests or overalls like this. With overalls being back, I would love to own this item because it can be classy with the addition of some pointy heels or casual with white sneakers. Either way, it would work perfectly for me and my obsession for fashion. I'm sure that I would end up wearing these overalls non-stop even when they've got to go in the washer..... just look at them! 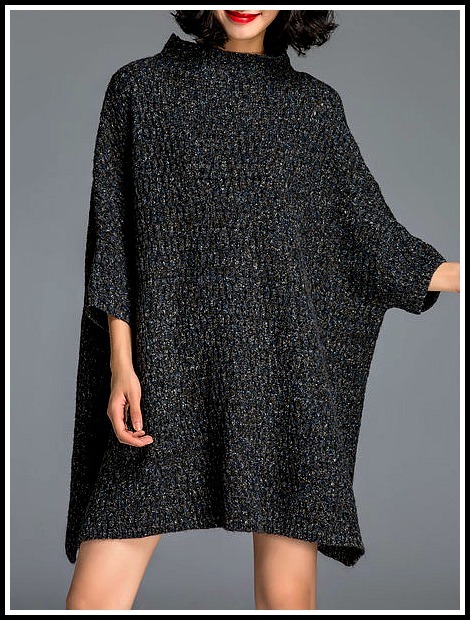 A-fall-must-have for me are sweater dresses because they're cozy, don't involve lots of effort and you feel like summer isn't over because you've got a dress on. Plus, I love that you can style them in many ways, with different hats, bags, shoes and coats. One sweater dress isn't enough to survive (during the colder days), so it's always good to stock up like never before. I know I will because unlike sweaters, sweater dresses can be a lot more feminine. I would love to know what's one item that you can't wait to wear this autumn/winter season? For me it's all of the above. For more style inspiration check out the StyleWe Blog and their Pinterest site! See you soon (every Thursday) and thank you for being here! Same here... I'll be on the lookout for new sweater dresses! I would love to... just followed you! Oh wow! They are so cute..I love them all.. I love the denim patches on the overalls ! Exactly why I was drawn to them! Yes, that would be great... I just followed you! Great post dear, I follow you, I hope you will follow back. It's pretty awesome... I love the clothing! I love the first dress, so chic! Great Style and looks !! Totally obsessed with the first dress! Great post, if you want we can follow each other? You're welcome... keep in touch! Wow! amazing picks dear, I love them all! Turns out that I'm already following you! I know it's hard to kick only one! Nice dresses specially the first one!! Love those picks! they are so stylish! What a beautiful post! Love them all. Thanks for sharing! Have a wonderful day! There are some cool items! I'm so in love with the first dress! Hello, I'm following your blog on GFC. I just followed you as well! I am in love with your blog! You are so talanted! Awww that is really sweet of you and thank you following me. Love the first one, so pretty! I'm loving these picks - especially the patchwork denim jumpsuit. I need that ASAP! Yes,that would be great. I just followed your blog. Hi, Radi! What an amazing selection! Thanks for your follow, I am staying here as your new follower #171. I'm following you on GFC... sorry don't have bloglovin.